Last week I wrote about the new blue Heritage collection jars from Ball brand canning products. After I published the post, a representative from Ball contacted me and asked if I'd like to give a case of these jars to one of my readers. Would I ever! I knew y'all would love a chance to win a case of these jars. These new blue jars are a little different color from the vintage jars, but they're just beautiful. The Ball Canning Company, manufacturers of the "Perfect Mason" jars for decades, used vintage jars as the inspiration for this lovely new product. Vintage jars are becoming hard to find, but now anyone can have these vintage-inspired jars in perfect condition! I'm really enjoying using these jars as casual vases for my cut flowers. See how pretty the clear blue glass is? You can check out Ball Canning on Pinterest for lots of great ideas using these gorgeous Heritage Collection jars. And thanks to Ball Canning, one of you can now win a case of six jars for yourself! To enter the giveaway, simply leave a comment on this post telling me how you'd like to use the jars. That's all there is to it! If you'd like an extra chance to win, like Imparting Grace on Facebook, then come back here and leave a second comment to let me know about it. The giveaway will end at 9:00 A.M. Eastern on Monday, July 1. I'll use a random number generator to pick a winner, and the Ball Company will send a case of jars directly to the winner! I would love to use them for flowers and decoration! I would love these! I would use them to store my grains, right now I have them in plastic and I'm trying to rid our house of plastic. I have some of the vintage blue jars. I use them for canisters. I put beans, macaroni, etc in them. They look pretty in my cabinets especially when I open my cabinet doors when I have guests in my kitchen. I would love to have more because I don't have enough! We would use them as drinking glasses! I think they would be right at home here at the new farmhouse! They match my pantry door perfectly! I like you on Facebook! Like you a lot!!! I don't know if I could narrow down a use for them... vase, organizer, kitchen accent piece. It's so hard to decide how I would use them. first of all I already like you on FB but wish there was a love button! Ive slowly been adding some colour into my decor and I've chosen the beautiful blues that we are seeing now. I could really do so much with these..love the vase idea. Oh pick me please!!! Love these blue jars! Perfect for a handful of wild flowers! I have a set right now so it seems selfish to want another BUT I am using them like crazy. Right now there are two filled with fresh flowers and the others are drinking glasses around the house. Because there are only 6 in a set, I'd love another to use for dry goods in my pantry. So pretty! These would be great for a vintage touch anywhere----daisies in the kitchen, for a child's rock collection, with seashells in the middle of a modern room, with straws and silver wear on the screen porch for a meal---- love them! Beautiful; I love the blue, Richella! They look so good with hydrangeas, too. I'd actually love to make some homemade iced tea and use these to drink it out of. I would use them for flowers and possibly for canning tomatoes. Wouldn't home grown tomatoes look great in these jars? I would use these jars for really fabulous pantry storage. I would use these jars for fun drinking glasses! Thanks for this opportunity, Richella!! I'd use them for holding silverware when serving a crowd. They'd be gorgeous and fun on the serving table. Thanks for what you do! I have been wanting some of those! Please count me in. 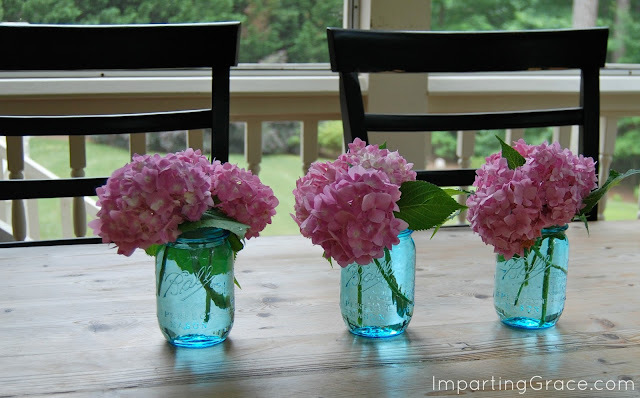 Love the Heritage jars and plan on using them for luminaries on my deck. Light up the night!!! 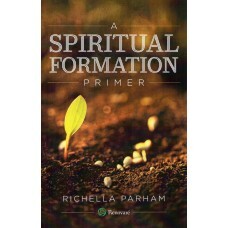 Thanks, Richella, for making this opportunity possible. Love the blog and love the jars! LOVE these. . .I'd use these for flowers and candles. . .thanks for doing this! I would use them in my craft room. I think they would add that perfect touch of color. I would also use them for flowers, as they make a wonderful vase. I would love to win! I just used a set of clear mason jars filled with flowers this weekend for a church dinner. They are so fun to decorate with and I love the vintage feel. I love these blue jars! They would look beautiful on display through my glass kitchen cupboards. I would use them for flowers too!! I would love to use these to display the flowers in our garden, as well as just put them on my display shelf all by themselves. They are such beautiful but functional jars. Thanks for the opportunity to win these. I would love to win! I would use them to make lanterns for my back deck! I love the blue, adorable! Thanks for the chance! I like Imparting Grace on Facebook! These jars remind me of my best friend who passed away last summer. She had some of the old ones and used them for flowers and I would do the same and think of her! I would use these jars for everything from drinking to displaying flowers. What a great give-away! Woohoo I liked Imparting Grace on Facebook. Love your blog! I,too, would use them for flowers. They would look pretty on a buffet table and placed around the house for a party. I would use them for flowers just like you did. Just beautiful! I would use them for a variety of things...would love to use them for fresh cut flowers, lantern, put flatware in it for parties, soap dispenser and make into a oil burner light and the list goes on. Thanks for the chance to win! I enjoy receiving your emails. I just love the vintage ones, but the new ones are gorgeous too! I would love to put flowers in them like you did and maybe turn one into a soap dispenser for my bathroom. It's the perfect blue for the room. I would love to have some to create some 4th of July luminaries! I just liked you on Facebook. I am looking forward to seeing your posts on fb as well as your emails. Thanks for the chance to win! Thanks for the opportunity to win something I was admiring from your blog about them. I would use them as drinking glasses. They'd be beautiful displayed on my stainless steel open shelving! I have always loved Ball jars. I use them everywhere to organize. I would love to win this set. Oh I think they would lovely at the cottage. Perfect tumblers for icy lemonade or tea! I have a ledge in the kitchen where I keep my dry goods (flour, sugar, oatmeal, quinoa, etc.) in Ball jars--old and new. I would love to use these for that purpose. I have a very old blue jar (with glass lid & wire) my mother gave me years ago with the very last jar of chokecherry jelly she ever made, and I display it proudly on my piano. If I win, I will use the jars to make jelly for my siblings (and me!). Thanks for the opportunity! I would use them for my daughter's upcoming engagement party. They would look beautiful with flowers on my tables. These jars would go so well with the lids I ordered to put in a straw and have the jars serve as beverage containers!! We would totally use these as drinking glasses! How fantastic to serve iced tea or lemonade this summer. I think I might use them for drinking jars! The possibilities are endless. But I think summer flowers lined up in beautiful blue jars on my picnic table would be awesome! I love the yummy blue jars and will use them to hold notions in my sewing room! I follow you on Facebook as well as your great blog! Would love touse them in an upcoming 50th anniversary reception event at our church for my in-laws. I already follow you on facebook..does that count? One way I would use them, is lined up on my mantle with tea lights in them....and some beach sand, too! I'd use them as sweet tea glasses. Beautiful! I am with most who have posted - it is hard to narrow down how I would use them. Vases - sure, canisters - yep! Maybe I would put one of the new solar light tops on one and see what happens. But they would be great with small American flags in them for the 4th of July. Since I collect blue and white china,etc. I would use these jars in many ways. I think sand in the bottom and a tea candle on top would make a cute outdoor centerpiece for the Fourth of July! Also drinking out of them with a cute red-stripe straw in them would be another Fourth of July idea. Thanks for the chance at the cute jars Richella! They are perfect for sweet tea! Thanks for the chance to win. I would use some to drink out of and some for decorations: toothbrushes and q-tips in the bathroom. Who wouldn't love these jars!!! Do you think the vintage jars were at one time as bright as the current jars and have just "aged gracefully" and gotten lighter with time? I would use the jars to organize my new desk. I love these blue jars!! We would use them for pretty much everything. I put cut flowers in them...I have mason jars in the bathroom for tooth brushes, cotton balls- I use them for holding loose tea, coffee, I even planted some bean seeds in one for the boys to see growing. I'd use the jars for all sorts of things. I love to put my dried beans and rice in them for storage. I'd put flowers in them. Refrigerator pickles. Salads for work. Leftovers. The options are endless! I would LOVE these jars and they would be perfect for me to use I our new home we are building and would use them in different vignettes. Hope I win!!! I use Mason jars to store my art supplies. Brushes, paints, pencils, I also use them for holding the rinse water that I use when painting. This new blue shade is beautiful! I would love to win them! I have liked you on FB as well. Thanks for the give away! When I say these, I envisioned filling them with some thing simple and giving them to friends. The jar is the best part!!! SO many uses but I am thinking lined up on a shelf filled with goodies for baking would be a fun way to use these pretty jars. Thank you for the entry! I would love to use these on my mantel. They would be the perfect touch there! I would use them for an outdoor meal and put votive candles inside! I would love to win a set of these Richella! I just found a large antique tool box that I'd like to put some blue canning jars in to use as a centerpiece on my table. These would be perfect. Please enter my name to win! Me again . . . to say please enter my name a second time. I just found your FB page am I'm following there as well. I really like them for flowers but also for cutlery in the kitchen, bathroom necessities, and maybe for drinking lemonade! Filed with handy things in my sewing room! I'm not sure; flowers of course are a great idea, but I just know that I LOVE them! My best friends daughter is getting married next spring, and she is using original blue mason jars for centerpieces. Turns out her grandparents had boxes of them in the basement! I would love to use them to fill with flowers and to give to friends or family to brighten their day. I will keep one for myself - blue is my favorite color - because when I would see my jar it would remind me of God's goodness to me and how much fun it was to bring some joy to someone else. Last year my daughter and I went to the dollar tree and purchased ball jars for a dollar each. We made Christmas snow scenes and gave some as gifts. These blue ones would be nice for that! My youngest daughter is in the process of buying her first little house. I'd gift these to her - they'd be perfect with her cottage style! I LOVE the jars so much. I think I want some to use as vases but as drinking glasses as well. So fun! I love these jars! Blue is a favorite of mine too! I would use these for decorations and to store things like splenda, sugar, etc on my counter. Would love to have a set! These jars are so pretty! I would use them for my baking stuff that is on a open shelf. so pretty! 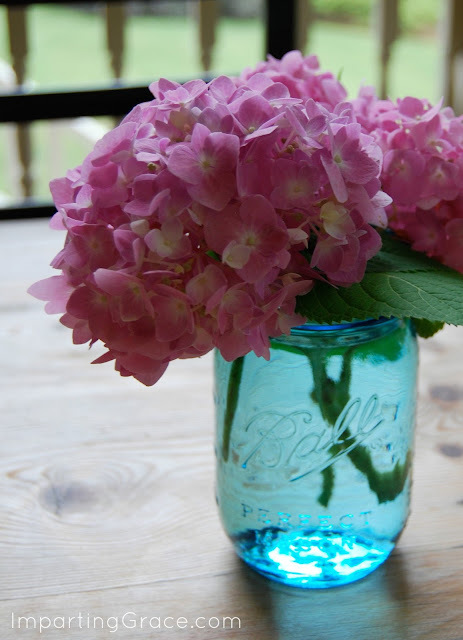 i love mason jars & would use these for flowers & storing things around the house! thx for the giveaway! I would give some to my mom. She has old blue jars from her mom & her grandmothers. I would use them for drinking glasses, food storage in my pantry, vases, etc. LOVE Ball blue jars! And, I liked you on FB! These are so beautiful! I'd use them as vases - perfect for windowsills of our office in our new apartment! what couldn't you use them for? they are so pretty! I think I will use them for some table decorations for me stepsons rehearsal dinner which my husband and I are hosting in our yard this summer! flowers... sand and shells.. oh the things I could do! I would use it to store beads. I would store rice, popcorn, grains, etc. They would be perfect in my kitchen with my stoneware! I would love to win a case. I've been debating buying one for myself. I'd use most of them for storage in my kitchen but one or two for my patriotic holiday theme centerpieces and summertime flowers. I want to use them in a line down the middle of my long oval table. I'd put flowers for seasons or holidays in them like red and white carnations for the 4th of July. I would use them with fresh flowers on my kitchen window sill. Thank you Ball, & Richella for the opportunity. I love the blue color. I'd use them as vases! I just purchased a galvanized steel bottle holder for 6 pint size canning jars. Would just look beautiful with blue jars and flowers. Still enjoying your writing. I would love to win these beautiful jars! Thank you for the opportunity! ....I liked of FB too! I'd love to win these blue jars! I'd just use them for candles (with salt or sand) for my screened porch...or maybe even just to drink out of this summer. Thanks for the chance! I also just liked your page on Facebook! What a great give away! I would use them as candle holders.